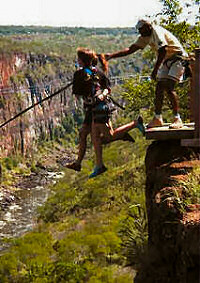 The latest adventure activities to come to Livingstone and the sheer gorges around Victoria Falls are ideal for them. The company, Abseil Zambia offers abseiling, gorge swinging, rap jump and cable swing experiences in the deep Batoka gorge. A platform has been erected on top of the gorge, and the ropes are strung out from safety pegs which have been drilled into the rocks. The helmeted client is attached to the main rope and safety rope from their harness. Then s/he is gently lowered over the platform. Slowly the rope is let out as the client makes their way down the rock face. Clients improve with each attempt and they can go down as often as time allows. On reaching the base of the gorge the client has the choice of walking out or being hauled back up. The walk up has been designed as an integral part of the day’s activities. A gentle slope with plenty of rest stops has been chosen. It is a pretty walk, especially now that all the trees are in leaf. This is the world's first commercial High Wire. A cable is spanned across the gorge 135m long and 75m above the ground. A full body harness is attached securely from your back to the cable and you take a running dive off the edge of the cliff. Soar across the deep gorge like a bird in flight. It costs US$65 for about a full day of abseiling and high wiring, gorge swinging and rap jumping during which time you can have as many turns as you like. For further details please visit the Website of Abseil Zambia. Sakazima Island W. Province Tel: 2711 4651534 . ZAMBEZI BOAT CRUISES Bwaato Adventures Livingstone Tel: 03 324106 . Considered one of the best stretches of commercially run river in the world, Batoka Gorge provides one of the most intense sensory thrills imaginable. 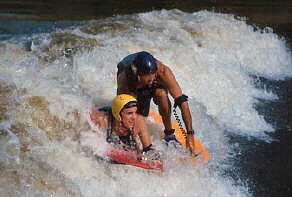 Its twenty three whitewater rapids and striking scenery deep within the sheer black cliffs afford the adrenaline junkie a wild roller coaster ride along a route carved over millenia by the Great Zambezi. 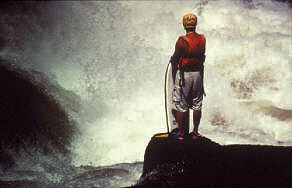 The rapids are run in large rubber rafts, launched from just below the Falls. You can do a half day trip, full day or two day. When the river is high, March - July, only the last 13 rapids can be done. As the water subsides, from June to February, all 23 are navigable. If you are keen for the ultimate thrill then a multi-day trip along the Zambezi is it! After a full day of rafting, you'll set up camp in the Batoka Gorge and listen as the wildlife, gaze into the campfire and a down a few cold drinks before you settle in for the night. Rise to a big breakfast, and the crazy adventure starts again! Perfect for a group (4+ persons) travelling together. Overnight camps are on sandy beaches on the river's edge deep in the gorge. Please see our Listings for Zambian Adventure Companies for bookings.